A short but intense downpour has wreaked havoc in parts of Bolivia. Weather experts blame El Nino and say there’s more dangerous weather to come. Deborah Lutterbeck reports. Havoc on the streets of Sucre Bolivia. A heavy downpour lasting about an hour and a half flooded streets – and posed challenges for drivers. 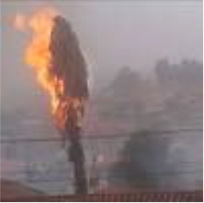 A tree, hit by lightening, burst into flames. And when it was all over, residents were left to pick up the pieces, many without electricity. In eastern Bolivia six students were injured when the tin roof of their shelter collapsed during an electrical storm. The erratic weather conditions have been blamed on El Nino — with authorities warning there could be more coming. This entry was posted in Bolivia, Environment, Santa Cruz and tagged agriculture, Chuquisaca, drought, environmental awareness, rainy season, Sucre. Bookmark the permalink.